The era of the plastic guitar gaming is coming to a close, something many people have seen coming, and most probably thought had already came. After over five years of weekly updates and over 4000 songs, Harmonix has desided to end regular DLC for Rockband. I say "regular" DLC, because there's always the chance for a special occasion, but for now it seems that Harmonix is focusing on other titles. I've been a fan of Harmonix since Frequency and Amplitude, and when Guitar Hero came out it was pretty much the coolest thing ever, and when Guitar Hero 2 came out it only got cooler. Being a Harmonix fan, and generally following the industry I knew that Rockband was the true successor to Guitar Hero 1 and 2, Guitar Hero 3 and all Guitar Hero titles onwards. All being cash grabs by Activision once Harmonix sold them their share in the Guitar Hero name. I loved Rockband, and like Guitar Hero 2 before it, Rockband 2 was even better. Then Rockband 3 came out, ... ... ... Don't get me wrong, Rockband 3 is a perfectly fine game, added lots off new songs, and the addition of the keyboard was cool. 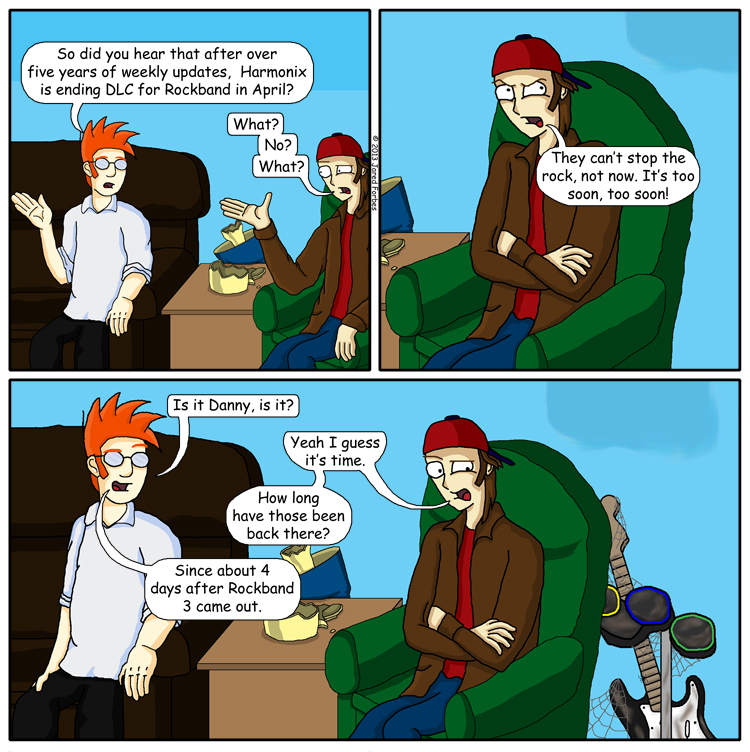 No it was other reasons, really when you think about it, it was stupid reasons I didn't like Rockband 3 as much. Now if you hadn't figured it out by the fact you're reading a webcomic made be me, I fancy myself a story teller. When Rockband 2 allowed me to make not just my player avatar, but avatars for the other three members of the band I was hooked. In my case I didn't just make avatars for the sake of making avatars, I was making characters, characters that I knew had a meaning, had a story behind them, because I gave them one. One that I actually started writing and hopefully one day I will come back to and finish, but I digress. I had become attached to these characters, Siren the lead singer, Billy Bluejeans on guitar, Lil' D on the drums and my personal character, Ryle on the bass. When Rockband 3 was announced they said that the game would feature a lot more use of your band in the story mode. When I read this I envisioned story mode cutscenes with the characters I created, and the addition of a fifth band member to play the keyboard, but that was not the case. What they meant by featuring the band, was to put them in loading screens, which is cool in it's own right I suppose, but the thing that got me was there was no fifth member for the keyboard. The game only has you make four band members still, and unlike Rockband 2 you couldn't assign them an instrument, instead when you started a song the game assigned the members roles based on the type of song chosen. My favorite instrument is the bass, so Ryle always was the bassist, but if the song featured the keyboard, visually the band didn't have a guitarist. If the song was sung by a male vocalist in real life, than a male character was the vocalist for that song. Now I can understand that some people might find it odd while playing Rockband, or Rockband 2 that a male voice is coming out of a female face, and visa versa, but for me personally the fact that no matter what song I played there was no way for me to get the game to assign Siren to sing, Billy to play guitar and Lil' D to play the drums. I know it sounds stupid to say, but since I had grown so attached to these characters, to see them behave in ways other than the way I intended them to act, it totally took me out of the game. It's because of that my plastic instuments have laided mostly dorment these past two years, and when I did actually pick them up for a few songs, it was Rockband 2 I played them on, not 3.